Mosaic molds its events into otherworldly visual masterpieces. 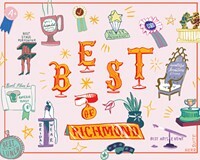 It’s a reputation that’s seen in the themes it crafts for the American Heart Association’s annual Richmond Heart Ball. In April, Mosaic brought the silks, dragons and bright reds of Asia alive for the ball’s Fortune of the Heart motif — while providing the catering too. The more than 20-year-old company, which also has an outpost in Charleston, South Carolina, can take care of the details such as planning, catering and scheduling needs for anything from corporate lunches to weddings. Gourmets, founded in 1999 by Brandon Bruce, is also known for its weekly specials and boxed lunches. And White House Catering does events both off-site and on at its elegant Old City Bar in Shockoe Bottom.